Box Text: Launched by the alien planet Zias, an armada of androids has crushed the Earth's conventional space fleet. Desperate and defeated, The United Nations of Earth has no choice but to counterattack with its own living, fighting machine, Bari-Arm. Upgrade weapons to get the awesome firepower of the Thundercracker, Burning Wave and Chase Cannon. 10-27-2012 exonerator Box Text Launched by the alien planet Zias, an armada of androids has crushed the Earth's conventional space fleet. Desperate and defeated, The United Nations of Earth has no choice but to counterattack with its own living, fighting machine, Bari-Arm. Upgrade weapons to get the awesome firepower of the Thundercracker, Burning Wave and Chase Cannon. 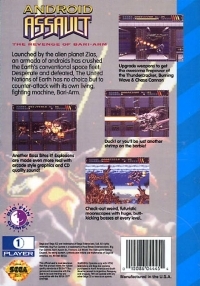 This is a list of VGCollect users who have Android Assault: The Revenge Of Bari-Arm in their Collection. 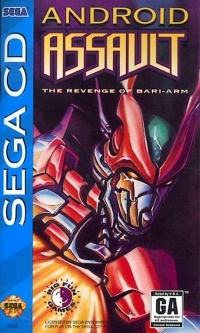 This is a list of VGCollect users who have Android Assault: The Revenge Of Bari-Arm in their Sell List. 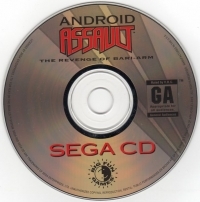 This is a list of VGCollect users who have Android Assault: The Revenge Of Bari-Arm in their Wish List.